Okinawa is a famous resort destination with the earliest cherry blossoms in Japan. Flowers begin blooming in mid-January and are best viewed by the end of January. We introduce 5 of the prettiest cherry blossom sites to visit which also have festivals! See the Cherry Blossoms Early in Okinawa! Okinawa Prefecture is located southwest of the island of Kyushu. Okinawa is a famous resort destination visited by many, and the year-round warm climate also draws people to its beautiful beaches and marine activities. Cherry blossoms in Okinawa have two special traits. Firstly, cherry blossoms in Okinawa are the first to bloom in Japan! The warm climate allows cherry blossom flowers to begin blooming in mid-January, which is the earliest in Japan. Secondly, cherry blossoms in Okinawa are different from those on the main island. Yoshino cherry trees are commonly found on Japan's main island. However, Okinawa has a large percentage of Kanhizakura trees. In comparison to Yoshino cherry trees, cherry blossom flowers of Kanhizakura trees have deeper shades of pink and bloom in a downward direction. The season for cherry blossoms in Naha City is as follows. For reference, flowers began blooming on January 10, 2018, and reached their peak bloom on January 30, 2018. In 2019, the cherry blossoms started blooming on January 10 in Okinawa. In this article, we will be introducing a list of cherry blossom festivals that are held during this season in Okinawa! Naha Sakura Festival 2019 is a festival is held at Yogi Park, a 15-minute walk from Naha's International Street. There will be over 400 trees exhibiting their blooms at the festival, which takes place from February 20, 2019 to February 24, 2019. The highlight of the festival is the riverside cherry blossoms. Visitors can enjoy a stroll and viewing the flowers along the river. There will also be a variety of events such as a folk song competition, hula dance performances, and food stalls. This is a festival fun for all ages! Naha City is located in northern Okinawa Prefecture. With the convenience of Naha Airport, the city is well-frequented with travelers. Make sure to visit Naha during the cherry blossom festival season! The Gusuku Sites and Related Properties of the Kingdom of Ryukyu is a UNESCO World Heritage Site in Okinawa. The Ryukyu Kingdom ruled what is now present-day Okinawa between 1429 to 1879. The Nakijin Gusuku Cherry Blossom Festival is held at Nakijin Castle, one of the nine designated sites. The festival will run from January 26, 2019 to February 11, 2019. Attendees will have the magical experience of seeing the illumination of the cherry blossoms and Nakijin Castle Ruins. However, cherry blossoms are not the only thing to look forward to! There will also be an opening ceremony and events, such as an Eisa (*1) dance, Nakijin Gusuku (*2) performance art shows and a Ryuso (*3) experience. Inside Nakijin Castle Ruins is Nakijin Village, located at Northern Motobu Peninsula in the northern part of the main island. The village is around 1 hour 30 minutes away from Naha by car. The area is close to sightseeing spots such as the famous Okinawa Churaumi Aquarium. Definitely make the trip for this special event! *1: Eisa: Okinawa traditional Bon festival dance. The Motobu Yaedake Cherry Blossom Festival takes place in Western Motobu Peninsula in Motobu Town, which is also home to Okinawa Churaumi Aquarium. Mt. Yae is 453 meters high with over 7,000 cherry blossoms. The hike from the mountain's halfway point to its summit has an especially stunning cherry blossom view. It is also fun view the cherry blossoms via rental car and take a leisurely drive up. On January 20 and 21, entertainment such as live folk song and street performances will be held at Yaedake Sakuranomori Park. 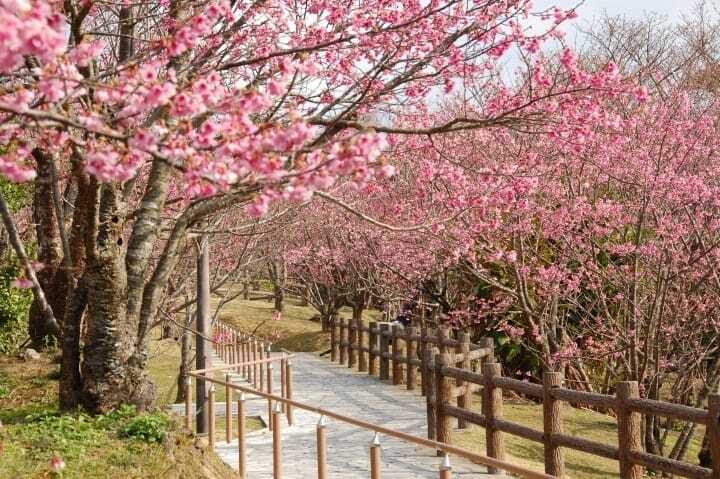 The Nago Cherry Blossom Festival is held at Nago Central Park, located in Northern Okinawa, Nago City, from January 26, 2019 to January 27, 2019. The park is one of Okinawa's best cherry blossom viewing spots and is known for its over 20,000 cherry blossom trees. Visitors are able to appreciate the contrast of colours of the cherry blossoms and the sea from the observatory deck. Events like Taiko dance performances will take place on stage, and the streets of Nago City will also have parades and shows. This is a festival enjoyable by all visitors! The 13th Yaese Cherry Blossom Festival is held at Yaese Park in Southern Okinawa Main Island, Yaese Town. The park is gorgeously lined with up to 500 cherry blossoms trees. During the festival period, illuminations begin from 18:00 to 21:00. The atmosphere becomes romantic and offers a very different experience than during a daytime visit. A sweeping view of Yaese Town can also be seen from the observatory deck. Other than Yaesu Park, a variety of events will also be held at Yaesu No Shi Chan Square. Locally produced products and traditional Okinawa performances and arts will be showcased, too. This draws a large number of travelers here. Yaesu No Shi Chan Square is accessible from Yaesu Park in 10 minutes by car. Shuttle bus services are also scheduled to operate. Okinawa has fewer transportation facilities compared to the main island of Japan. Although Naha is well-equipped with public transportation facilities such as trains and buses, tourist destinations outside the city area are best accessed by car. Car rental services are available at Naha Airport and Naha City. Enjoy Cherry Blossoms Early this Season in Japan! Cherry blossoms in Okinawa Prefecture are the earliest to show their blooms in Japan. They are a different variety from what is common on the main island and have a beauty of their own. Make sure to include Okinawa in your upcoming trip itineraries for cherry blossom viewing!